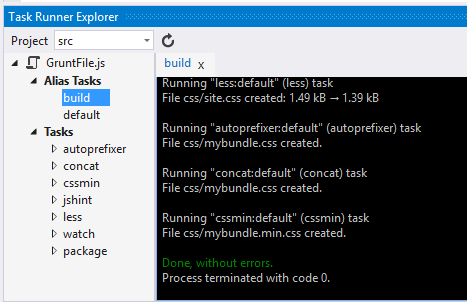 Provides custom task runner support to Visual Studio. A task runner for Grunt and Gulp directly within Visual Studio 2013. 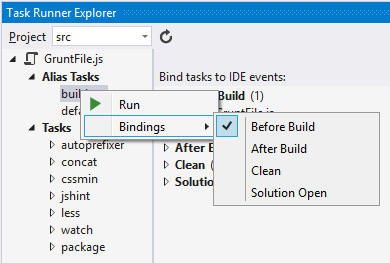 You can also bind any Grunt/Gulp task or target to a Visual Studio event, such as Build and Solution Open. That way you can run certain tasks when you build your project or run Grunt Watch when the solution is opened. This is an early preview of the Grunt/Gulp support coming in Visual Studio "14" and we would appreciate any feedback you can offer at this point. The goal is to make support for Grunt/Gulp first-class citizens in Visual Studio, but we need your help getting this as good as humanly possible. Please use the Discussion tab on this page or use Twitter (@mkristensen) to provide the feedback. For Grunt: "npm install grunt-cli -g"
For Gulp: "npm install gulp -g"